I had a lovely day on Saturday! Rosie did a fab job of the organisation and of looking after all the talented crafters and visitors that came through the door. I made some more gingerbread men, as requested … I think they were the most successful batch yet, so will be sticking with this recipe for the time being. What do you think, do you think my decorating skills are improving? I think it makes such a difference to a fair when the organisers have made an effort to advertise, prepare for and plan their day. There is nothing worse than going to a fair where you know more about what is happening than the actual organiser (yes I have been to some like this believe it or not). I don’t think selling at fairs is for everyone. Some people see it as a necessary evil, others just plain hate the effort that it takes, me, I love it! I love to see people’s expressions when they are viewing my goods. I like to interact with my customers and get to know them a little bit. Through craft fairs I have found some of my best customers, and yes I did say I found them not the other way around! Craft fairs are hard work. There is the organisation of stock, planning your table, making sure you have everything that you need, travelling and then sitting with your stock being friendly and talking to people for a number of hours and being cheerful about it – even if you know you have a pile of washing to do, the cat’s thrown up on the carpet and you have a thousand & one things that you would like to be doing right then. I think though that it is worth all the effort – I genuinely have fun at 95% of the stalls I attend. I can’t believe it has been a month since my last post! Or Helfa Gelf for that matter! So, what have I been up to? 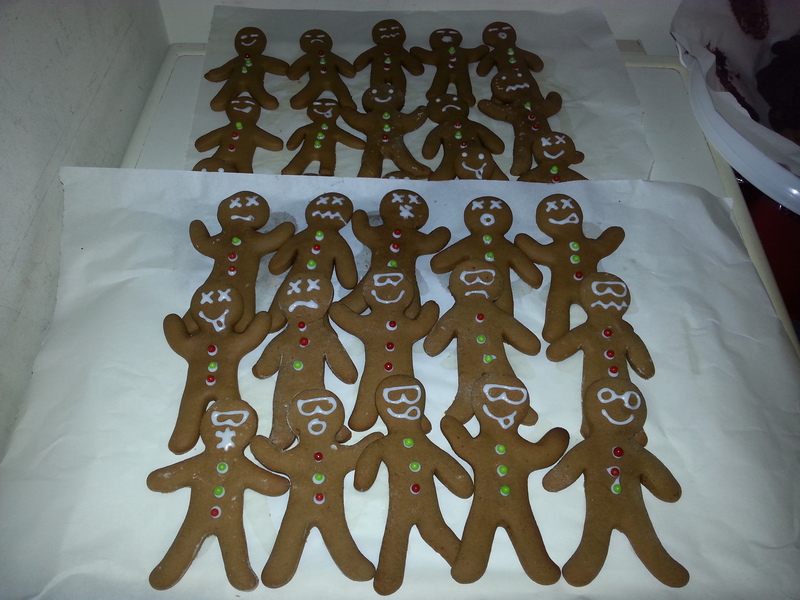 Well there have been the usual craft fairs and of course the last weekend of Helfa Gelf (More psycho gingerbread men). There have been new makes and commissions. My favourite new make is a set of mix n match Christmas Studs. The idea is that you pick two studs and call them a pair (whether they match or not lol). I’m thinking of maybe enamelling a couple of them to add a splash of colour? What do you think? Would you like to see Rudolph’s nose red? Pics are below …. I’ve also update the store with all my Christmas makes. So that is that job done! Once the Christmas stock is gone, it’s gone (apart from the studs – I may be persuaded to make more). I’m pretty please with the selection I have this year. I seem to have something for all ages. I’m booked in this month to have a stall at the Daniel Owen Centre which is supporting the Alzheimer’s charity. I’m also booked in on the 1st November at the Coconut Shy Vintage & Artisan fair in Whitchurch which looks like it is going to be a good day. I’ve also been given a couple of commissions to make some really nice jewellery, not that my normal range isn’t nice but these are extra special using some really nice metals and stones. Can’t wait to get started on them. If it’s ok with the buyers then I will post pictures as I go. And that as they say is about it for this post … will post again after the fair on Saturday to show you how it’s gone ….